Estonian National SO/Vello Pähn (Tobias); Arvo Volmer (Eller, Sumera); Peeter Lilje (Tubin); Nikolai Alekseyev (Tormis); Neeme Järvi (Pärt 3); Paul Mägi (Cantus); Paavo Järvi (Tüür); Heino Eller (Homeland Melody). 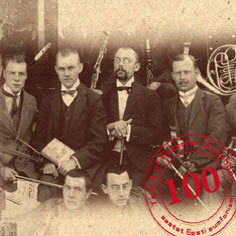 This handily portable survey gives us a cross-section of Estonian orchestral music from the 1890s to the 1980s. The performances are sure-footed and all drawn from the sound archives of Estonian Radio. I rather hope that eventually there will be a second volume. This may well have been intended as a musical ambassador for Estonia and an encyclopedia entry on Estonia's symphonic treasury. It certainly fits both those bills. However, for the serious collector there are some twinges of regret. The Pärt works already exist in easily accessible versions internationally and the same goes for the Tubin. I believe there have been recordings of some of the other works too. However, for most of us the collection is a stimulating and valuable introduction. The set - which has been around for a while now - is contained in a three-way fold-out card sleeve with two pockets for the CDs and an insert compartment into which the booklet fits. The booklet and card sleeve are in a sepia-coloured rough-fibrous wood-grain effect with sombre red or dark brown characters. The helpful essay by Evi Arujärv is in both English and Estonian. The only drawback is that only some of the works included here are actually mentioned. Rudolf Tobias's Julius Caesar is an attractive piece with some expectedly portentous passages. Otherwise it has the sort of heroic lightness of demeanour expected from a music that sounds as if it has been influenced by Mendelssohn's Ruy Blas on one side and Weber's Euryanthe on the other. The self-same overture appears, differently coupled, on another Estonian double on Chandos with the RSNO and Neeme Järvi. Heino Eller also features on that Chandos duo; not to overlook a particularly generous Antes Edition CD and separate discs of his piano music on Toccata (vol. 1 vol. 2). Out of the blue, earlier this year (2017), he commanded a whole orchestral programme on BBC Radio 3. His symphonic poem Night Calls has a foot in two centuries: late 19th romanticism and early 20th nationalism. Tchaikovskian passions and lyrical serenades from the woodwind and engaging delicate harp swirls. There's a colourful Rimskian aspect (14:00) to this writing. Parallels can also be drawn with the worlds established in the very early Bax tone poems and by hothouse Scriabin (16:10). It's a lavish score. It’s good to report that this does not duplicate the Chandos or the Antes collections. The Tubin, written in the late 1930s, also looks backwards in a nationalistic way. It adds a fresher impressionistic layer to the composer's expression. The three movements are laid out here with the first two in one track and the third allotted a track of its own. This is an early work from a composer who was still writing symphonies in his seventies. His is not a Sibelian soundworld; at least not here. The music is tense, complex, gravely symphonic in its bearing, lush and always tonal-melodious. He is his own man but tributaries from Rimsky, Scriabin and early Stravinsky flow in to his palette and swirl the waters. The muted throb that underpins much of Tubin's music becomes more brazen in the gale-buffeted Finale. This closes in a most contented sighing glow which sounds like the epilogue to Bax's Seventh Symphony (1939). Estonian Record Productions have not used existing commercial recordings but instead present the work in the hands of one of Estonia's finer but lesser known conductors, Peeter Lilje (1950-1993), who died young. Tormis chose a rather impersonal title for the last item on CD 1. This overture is from Estonia's long Soviet years. At first it is shaken by a desperately potent urgency, heroic character and a touch of Shostakovich at his most propulsive and populist. The music then becomes more silvery and intimate before returning to the kinetic fury of the opening. I wish we could hear more orchestral Tormis (Cloud over the Moon, Overture No. 1 and Ocean). For decades now the primary representation for this composer has been in choral music. CD 2 starts with Pärt's Symphony No. 3 which is dedicated to Neeme Järvi. This single-movement construct is characterised by fanfares raw, gaunt and regal. These are coupled with searing strings, slowly spun and momentarily furious. That same fury can be felt in the accelerating drum cannonade at 12:10. The symphony is also influenced by music of the Orthodox church but closes on a savage strut cut short. It is followed by the single most travelled Estonian work (Pärt's Cantus - In Memoriam Benjamin Britten), completed four years after death of the composer it memorialises. Has any work written as an 'in memoriam' to Britten been as successful? In this performance it feels quick but then I looked at the Chandos Järvi set where the timing is almost two minutes shorter. My expectations were in fact shaped by a broadcast by Rozhdestvensky and the BBCSO at the 1979 Proms where a very slow pulse stretched the music out most movingly. I wonder what Pärt's preference was. Sumera's Fourth Symphony is conducted by Arvo Volmer who has recorded all the Tubin and Madetoja symphonies for Alba and has done good work in Australia. The symphony is in four movements played attacca and here in a single track. This is a compressed piece only in its structure, for its moods and manner are epic and imposing. The second half of the symphony is in part an uproarious whooping jostle as if Petrushka's Easter Fair has been let off its leash to pursue its own feral devices. It finally runs out of sap and descends into a supernaturally cool Sibelian gleam - rather like a certain Swan but shorn of the cor anglais part. Sumera's six symphonies are on Bis: 1-3: CD660; 4: CD690; 5: CD770; 6: CD1360. The second disc ends with two works. There's Tüür's Exodus - a very different animal from the same-titled score by Wojciech Kilar. The Tüür is a dissonant thrashing simoon of a piece for much of the time but ultimately finds a simple quietly shimmering peace. This has a religious feel and touches on Pärt's Cantus. We finish with Eller's short and heartfelt Homeland Melody, the Delian musings of a most gentle wight. It's a live performance conducted by the composer and it's the only track with applause. This is a varied selection with the emphasis lying away from the avant-garde.